Composite materials were first used in the marine industry back in the 1970s, when Hexcel supplied glass reinforcements for performance boats, canoes and dinghies. Since then, Hexcel has developed a wide range of composite materials to meet marine industry requirements. Hexcel manufactures a full range of HS, IM & HM fibers from its own PAN. 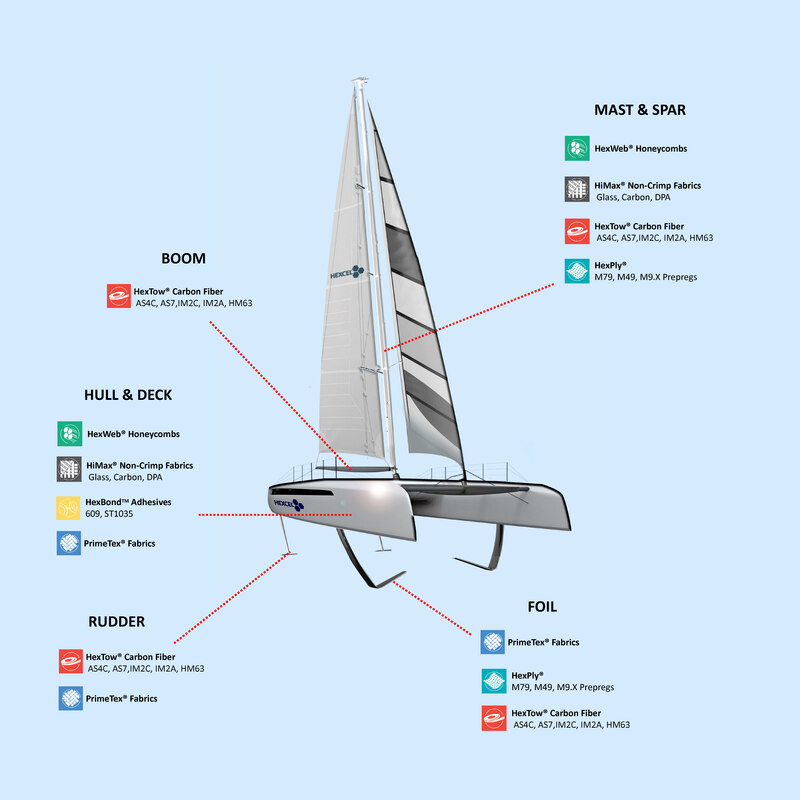 The success achieved by winning competition yachts built with Hexcel materials has led the introduction of unique products including HexTow® IM7, IM2 and HM63 carbon fibers. Hexcel is a leading manufacturer of HiMax™ non-crimp fabrics, supplying a wide range of Lloyds Register approved fabrics for boat-building. In addition to the standard range of E-glass and carbon NCF, Hexcel works closely with customers to understand their specific requirements and propose customized solutions. Hexcel also offers a unique method of tackifying fabrics called HiMax™ DPA (Dot Pattern Adhesive), designed to help composite manufacturers maintain the desired position of the reinforcement prior to resin introduction. Our market leading HiMax™ range includes our ultra-lightweight carbon biaxials, reinforcements with micromesh, woven with enhanced infusion and non-print through as well as carbon unidirectional tapes, solutions for infusion control and non-stitch finish. Hexcel offers the largest range of woven reinforcements in the marine industry and is acknowledged by boat-builders around the world. HexForce® fabrics enable our marine customers to design high-performance boat structures with a full portfolio of carbon and glass woven reinforcements. A wide range of fiber selection, weaving styles and areal weights are available to meet industry requirements for hulls, decks or foils manufacturing. Hexcel also supplies PrimeTex® carbon reinforcements, processed to provide enhanced aesthetic appearance for high-quality boat parts thanks to smooth and closed weave fabric.